Many feel that they just don’t have time to eat healthy, especially at lunchtime. It’s just so easy to pop down to the corner deli or fast food restaurant and grab something quick during a busy day at work. Or, to just opt for that boring cold-cut sandwich, that does little to nourish your body the way it needs to be. 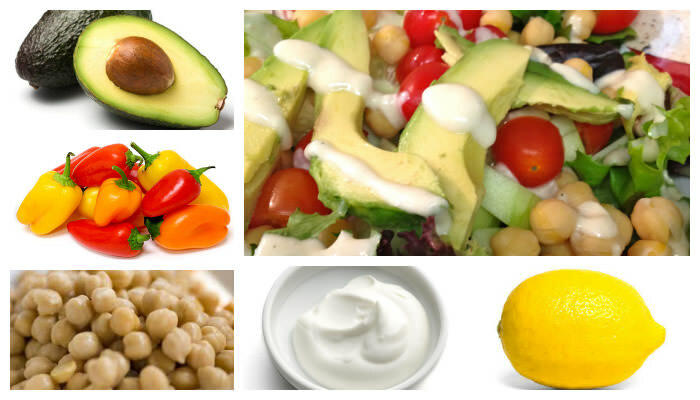 My top 7 easy and nutritious lunches that can be prepared in about 10 minutes for around 400 calories or less. This is one of my typical quick lunches. It’s quick, nutritious, and delicious. In a small blender cup (I use a Ninja) place the almonds and half of the water. Blend until almonds are a creamy texture. Basic Nutrition: Calories- 416, Carbs- 54.1g, Protein- 17g, Fat- 21.3g, Fiber- 10.3g, Sodium- 61mg. 8 Kashi Heart to Heart Whole Grain crackers. Slice the avocado in half and remove the seed. 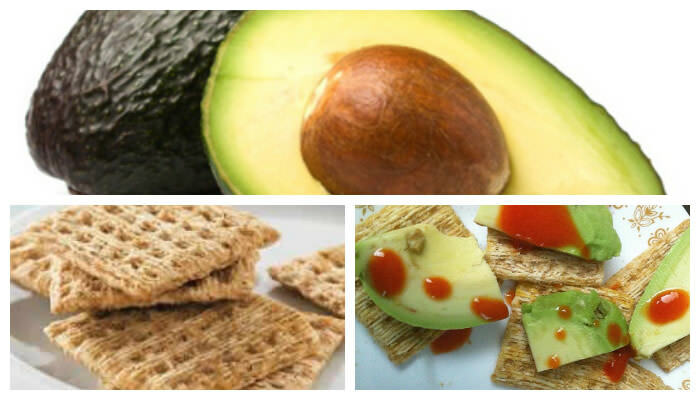 Spoon the avocado on the crackers and enjoy! Variation: Add a drop of hot sauce or Sriracha to each cracker. Don’t let the fat in avocado scare you, it’s good for you! Mix the tuna, yogurt, and lemon pepper seasoning together. Divide among the three lettuce leaves. Top with sprouts and pumpkin seeds. 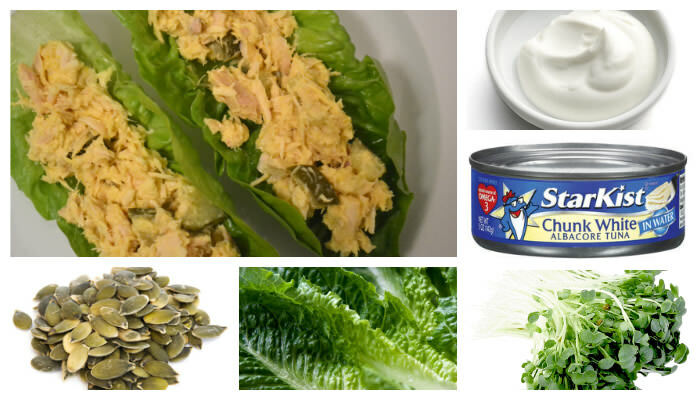 Fold lettuce over and eat like a wrap. Place pre-washed salad mix, pre-shredded red cabbage, and other vegetables in a bowl. Garnish with the chic peas. Mix the yogurt, garlic salt, and lemon juice well and then drizzle on top of the salad. Enjoy! Hot sauce, lime juice, and/or cilantro to taste. Thaw fish fillet in the microwave for about 35 seconds. 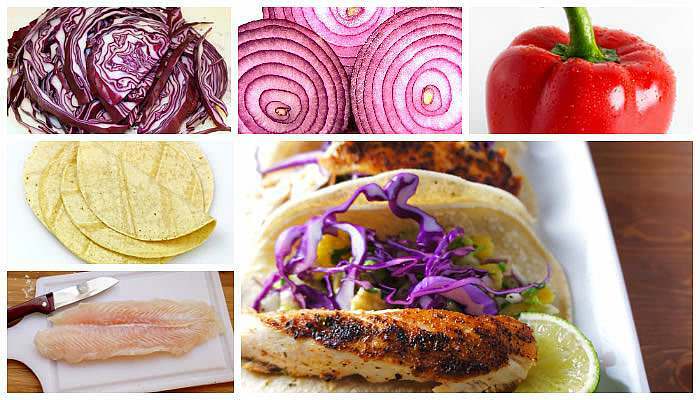 Cut fish into cubes, slice half an onion, and slice the pepper into strips. Place all three in a medium heated nonstick skillet with the olive oil and seasonings. Cook for about 8 minutes stirring often. While cooking spread yogurt in the middle of the 3 tortillas. Once cooked; divide fish, onions, and peppers on the 3 tortillas, top with cabbage, hot sauce, cilantro, and lime. Enjoy! 6. 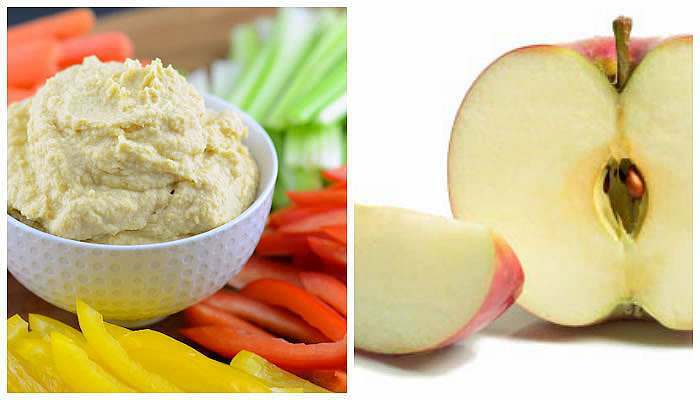 Hummus, Veggies, and An Apple. Buy a quality prepared hummus in the flavor of your choice. Buy a bag of pre-washed raw veggies or cut your own ahead of time. Use the hummus as a veggie dip. Eat the apple separately. In a small nonstick skillet heat the chicken strips and black beans along with the chili lime seasoning. 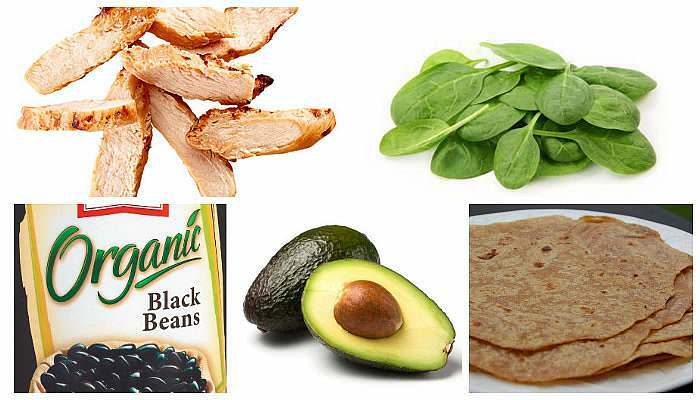 Heat the tortilla slightly and then add the hot chicken and beans, the avocado, the salsa, and the spinach. Roll the burrito by tucking in both ends first. Enjoy! I realize that many people don’t have jobs that allow them to cook, but most of these can be prepared ahead of time and just reheated at lunch time. Some of these quick lunch ideas may have too much sodium for those on a sodium restricted diet. This can be adjusted by cooking a batch of fresh chicken ahead of time on the weekends or making your own hummus to use during the week. Anytime we rely on convenience, pre-packaged foods, we also up the our sodium intake. I used Calorieking.com to calculate my nutritional information, so these amounts could vary depending on specific brands chosen. 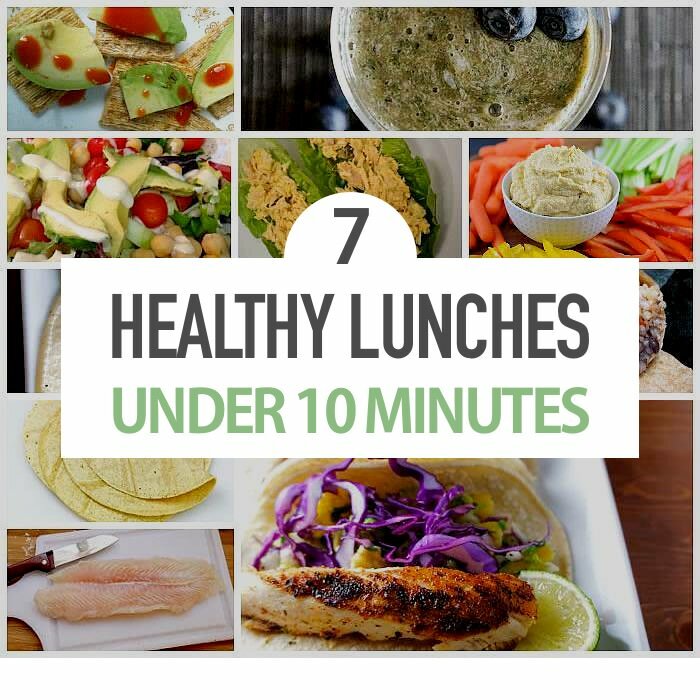 Do you have any 10 minute or less lunch ideas to add or share with us? Hi Beth, Aquaculture isn’t necessarily a bad thing and actually is a sustainable way to eat fish and seafood. Just make sure the farm-raised fish is from a good source. They are really written so easy, that everyone can understand and decide to eat healthy! I printed all the fotos and put them to the fridge,on the kitchen. And every day it hepls me to plan meal for a next day. I think, it is really a usefull idea. And best wishes from Russia. That’s great. Glad it helped. Glad you found this helpful and keep up the great work! 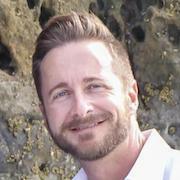 They are realli written so easy, that everyone can understand and decide to eat healthy! I think, it is really usefull idea. Wise words. But to be honest, working in the office, I WANT to get out for a while. Go somewhere else. I notice that when I bring in my own lunch I typically never leave my desk. It’s all these little habits that define how we eat. Excusses… Excusses… lol take it to the beach and eat 🙂 beats a cafe or bread shop any day! Time is an issue here, too. We eat a lot of quick and easy salads based on whatever’s in the fridge. Since we buy only healthy choices, putting together a healthy meal is a snap. We follow the Zone diet principles at our house so all meals have balanced amounts of carbohydrate and protein plus a moderate amount of monounsaturated fat. Tonight it’s rollups of hormone-free deli-style turkey slathered with olive hummus. I cut the roll-ups in large sized pieces and placed them on top of bagged pre-washed romaine lettuce. Then I spooned some spicy roasted chili salsa on top and drizzled all of it with a tablespoon of extra virgin olive oil. Dessert was a snack size unsweetened applesauce cup with with some cinnamon mixed in. 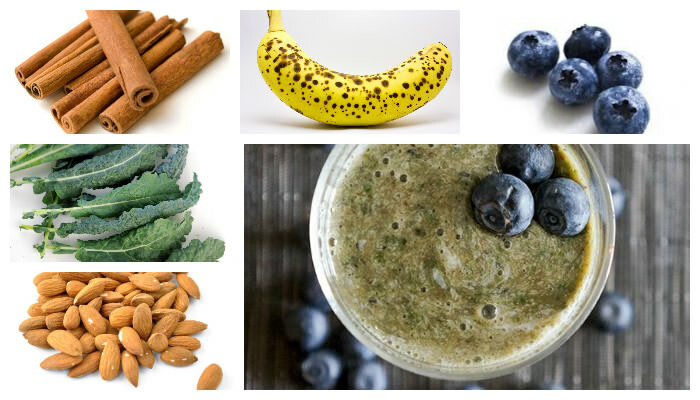 At first glance it might appear to be a crazy combo but it’s absolutely delicious! Because of my schedule, I generally eat breakfast-y foods for lunch. My favorites are steel-cut oats (I cook them ahead of time and pack them in Tupperware and just reheat them at work) and an apple and a container of Greek yogurt. I mix the yogurt with the oats and top with a bit of cinnamon. That and some coffee and I’m good for the rest of the afternoon. I also love to mix plain Greek yogurt with salsa and use that as a dip for cut up veggies–jicama, carrots, celery. I’ll have that along with some cheese and a piece of fruit. It’s not fancy, but it is pretty tasty. I’m too damn lazy to do anything.